The bone skull Beak mask is colored as pictured. Mask is one size fits most with an elastic tie. 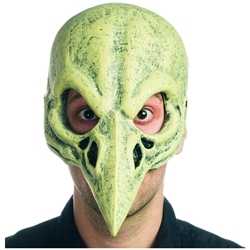 Quickly and easily create an undead bird or plague doctor for Halloween, haunted houses, and any other masquerade where you want to provide a scare. The mask has a yellowish tint to it. For a plague doctor costume wear with a hooded robe and for an undead bird costume pair up with black wings.